Building 12 could be demolished as early as Summer 2014, pending approval from the City of Cambridge. The building’s demolition will make way for the Nano-Materials, Structures, and Systems Lab (nMaSS), to be completed in 2018. Turning left off of the infinite corridor at Cafe Four could soon lead to a new destination. Director of Campus Planning, Engineering & Construction Richard L. Amster, confirmed that Building 12 could be demolished as early as this summer, pending approval by the City of Cambridge. The removal of the building will make way for the Nano-Materials, Structures, and Systems Lab (nMaSS), which is projected to be completed in 2018. According to an MIT News Office press release, the American Association for the Advancement of Science (AAAS) included five MIT professors in the group of 388 scientists it named as fellows last Tuesday. Editor’s Note: This article originally ran 30 years ago in Issue 54 of Volume 103 of The Tech on Friday, Dec. 2, 1983. 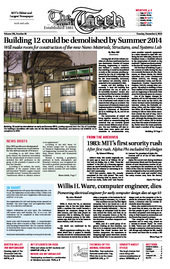 “From the Archives” is the first of a recurring segment where we reprint articles from The Tech’s archives that are relevant or interesting to today’s MIT community. Willis H. Ware SM ’42, an electrical engineer who in the late 1940s helped build a machine that would become a blueprint for computer design in the 20th century, and who later played an important role in defining the importance of personal privacy in the information age, died Nov. 22 at his home in Santa Monica, Calif. He was 93.